MOLLUSCA : NUDIBRANCHIA : Aegiretidae SNAILS, SLUGS, ETC. Description: This animal is usually 10-20mm in length. It is very inconspicuous, brown (rarely white) in colour, but can be easily identified by the many knob-shaped tubercles and the tiny iridescent blue spots scattered over the back of the animal. The oral tentacles are short and rounded and the rhinophores are smooth. The rhinophores emerge from sheaths with large papillae at their edges. 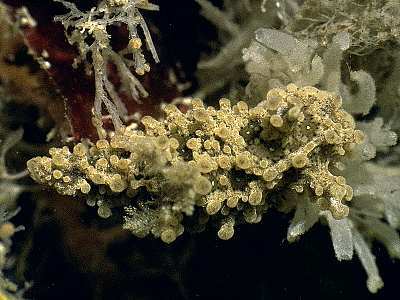 Habitat: A. punctilucens is well camouflaged amongst its food, the calcareous sponge Leucosolenia botryoides, and may be hidden inside a clump of the sponge. Distribution: Occurs all around the British Isles and south to the Mediterranean. Iridescent blue spots on the mantle. Smooth rhinophores, unusual for a dorid. Picton, B.E. & Morrow, C.C. (2016). Aegires punctilucens (Orbigny, 1837). [In] Encyclopedia of Marine Life of Britain and Ireland.